Remington Stalker Hide 4-in-1 Parka. Photo by Chuck Hawks. I've been a life long shooter and hunter but, to be honest, have paid minimal attention to outdoor clothing. In fact, I've never been very interested in any type of clothing. I'm satisfied if it keeps me warm and meets generally accepted standards of modesty. So I'm learning as I explore the Remington clothing line. These field-tested Remington licensed products are sourced from the Brinkman Corporation, who knows a thing or two about outdoor wear. Concealed collar hood with elastic string, cord locks and beard protector. Outer coat is waterproof, breathable, and windproof. Zip-off sleeves converts to vest. Cargo pockets backed with tricot-lined hand warmer pockets. Removable, black, zip front insulated liner jacket can be worn alone or combined with outer liner. 6 ounces of polyester fiberfill insulation. The Stalker Hide parka is constructed with fiberfill insulation and a Rem-Tech laminate for warmth and comfort. The exclusive Rem-Tech laminate material makes this parka 100% waterproof, windproof, and breathable. Rem-Tech keeps natural elements on the outside, but "breathes" moisture buildup away from the body on the inside. All seams are taped for 100% waterproofing. YKK zippers are used throughout. There are lots of nice touches. For example, a storm flap that snaps securely in place protects the front zipper of the outer shell. And there is the option to zipper (and snap) the parka clear up to the chin, or flop the collar back in a conventional manner. There is a snap at the neck to help secure the inner liner in place (as well as full length zippers), and there are snaps on the cuffs of the parka sleeves for the same purpose. All of these snaps have an auxiliary snap to hold them neatly out of the way when the liner is removed. There is elastic at the cuffs of both the outer parka and the jacket liner to keep them snug around the wrists. Snap flaps or zippers keep the pockets secure. And the jet black inner jacket/liner has its own slash pockets. There is even a swivel hook under the flap of the left cargo pocket to which you can attach something (keys, maybe?). I don't really know what it is intended for, but it's there. The outer shell is 100% polyester and the lining is 100% nylon. The inner jacket/liner has a 100% nylon shell, 100% polyester lining, and 100% polyester padding. Both are made in Bangladesh. The outer parka is quiet when moving and in brush, unlike noisy nylon outer shells. The micro polyester tricot fabric is a warp knit material that offers a superior strength to weight ratio. It is extremely abrasion resistant, burr proof, and will not pick up clinging vegetation. 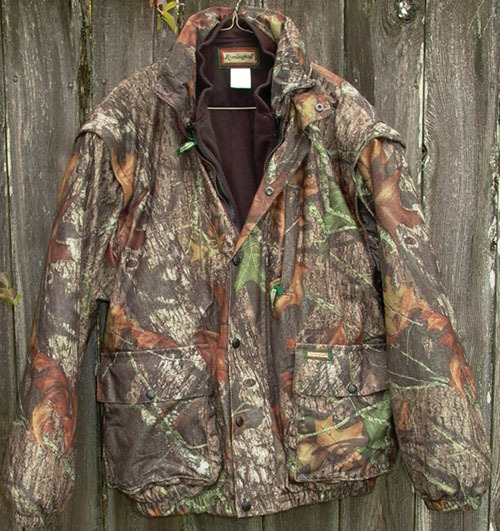 Since I acquired this Stalker Hide 4-in-1 parka the week after deer season closed, I was not able to wear it hunting. However, last weekend we did go up into the hills for a little recreational plinking and, being in Western Oregon, we naturally got caught in a downpour. It was chilly, so I had the liner zipped into the outer parka. I made it a point to do a little pretend stalking in the woods, though, as well as stand out in the rain like an idiot, plinking with a .22 pistol. I am happy to report that the Remington Stalker Hide Parka worked exactly as advertised in every respect, keeping me quiet, warm and dry. My companion, wearing a ski parka, got drenched. The Stalker Hide is definitely my new #1 inclement weather parka. Also available are the matching #18703 camo insulated pants. These will be featured in a future review. An alternative for those required to wear blaze orange during hunting season is the #18731 Blaze Orange and Blaze Orange Camo parka, similar to the #18730 reviewed here except for color. The Remington Stalker Hide 4-in-1 parka is an impressive piece of outdoor clothing. It's a well designed and a genuinely useful/versatile product. Highly recommended.